Many years ago, I received a Timex Internet Messenger watch. Back then, my parents used it to send me a message when it was time to come inside after a day of playing with my friends in the neighborhood (like I said, this was a long time ago). I loved the thing, and I’m not entirely sure why– it was just a watch. But my obsession with the Timex was an indicator of a budding obsession for the latest technology. At this point, I didn’t have a cell phone or laptop, and I barely had my own desktop computer for the little homework I had. Yet I was still fascinated with the ability to receive a message on my wrist, and always be connected– even it was just to my parents. Fast forward around eight years, and it’s the year 2013. We have desktop computers powerful enough to render 3D worlds, and computers almost as powerful in our pockets. The smartphone sitting on your desk or in your pocket didn’t even exist eight years ago outside the mind of forward thinking individuals. As I sit here on my laptop, my watch chirps. Like the Timex that seemed as if it were from the future, which has long since been lost in my drawers, it dinged because someone had sent me a message. The watch I’m currently wearing is the Cookoo, which was crowd funded on the Kickstarter platform this last Summer. I recently attended CES and had the priviledge of meeting with several individuals from companies funded by Kickstarter backers. By random chance, walking one of the several massive halls in the Las Vegas Convention Center, I ran into Peter Hauser– the man behind Cookoo. Stacked behind him was a literal mountain of watches– products of the world we now live in. Eight years ago, a product like Cookoo that began in the mind of an individual, would probably not have existed– at least not in the form we have today. Instead, it may have been a product of a large corporation, or it may have not existed at all. Thanks to Kickstarter, a futuristic idea, the ability to be always connected, was able to take shape in the physical world. Like the Timex I used to wear, the Cookoo is designed to keep you connected with the outside world– even when you do not have your phone in your hand. While the device doesn’t connect to a pager or cell phone network to receive messages, it does connect to the device most individuals carry– a smart phone. 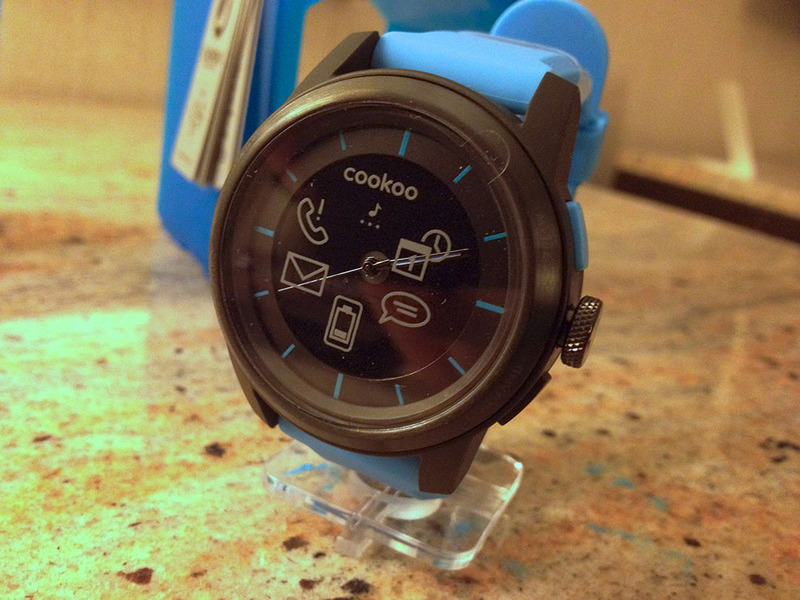 The Cookoo displays Facebook notifications, alarms, reminders, and missed call notifications. In addition, you can drop pins on a map, check in to locations on Facebook, take a photo remotely by pressing a button on the watch, and control music playback on your phone. First and foremost, the Cookoo is a watch. This isn’t the Pebble or Sony Smartwatch watch, and the Cookoo isn’t remotely like any of the variations of digital smartwatches that have LCD or E-Ink screens. To a passerby, you’re just wearing another analog watch. Depending on what type of person you are the Cookoo may be perfectly discreet. Physically, the watch is large. It is certainly thicker than your normal watch, but it is smaller than some of the expensive mechanical dive watches you may find in a jewler or specialty watch store. While the purpose of a dive watch’s thickness is to withstand the immense pressure of deep water, Cookoo’s size is largely attributed to the fact it houses two removable batteries, Bluetooth electronics, and the time keeping piece itself. However, despite its size, it isn’t unbearable. I have extremely small wrists and often have issues with watch bands being too large, but the Cookoo, while it takes some getting used to, fits fine. Just for reference, I normally have the little stick that goes through the band in the fourth-smallest hole. The band itself isn’t anything special, but it’ll keep the Cookoo on your wrist without any problems. The buttons–all four of them–are placed in the standard corners, and they feel solid and give decent tactile feedback. I’m not worried about them breaking or getting stuck. The button in the top left is for turning on the backlight, while the top right changes the watch from beep and vibrate to vibrate to just beeping to silent. The bottom left button is for pairing the watch to your phone, while the bottom right is the programmable “command” button. A short, medium, or long press of the command button performs a task you configure from the app on your phone. Arguably, the watch face itself is the most important piece of the device. If you can’t read the time on a watch, it’s useless. The Cookoo has a standard, black watch face with no numerical markings. I have the black-and-blue watch, so the little notches indicating the hours and minutes are all blue. The Cookoo’s face works fine for its purpose– telling the time. It’s simplistic, clean, and relatively easy to read in daylight. The hands themselves are your standard watch hands, with the hour and minute hands having blue highlights on them. The seconds hand is a standard, black stick. My one gripe with the face of the watch is that the hands and hour markings do not light up or glow. This is a small issue in the dark, because while there’s a blue backlight that allows me to see the silhouette of the hands, it can be difficult to distinguish between the hour and minute hands. It’d have been nice to be able to have the blue highlights glow, mainly so you can distinguish between hours and minutes a little bit faster when you’re just glancing at your watch. Other than the lack of glowing markings, the face is relatively nice looking. 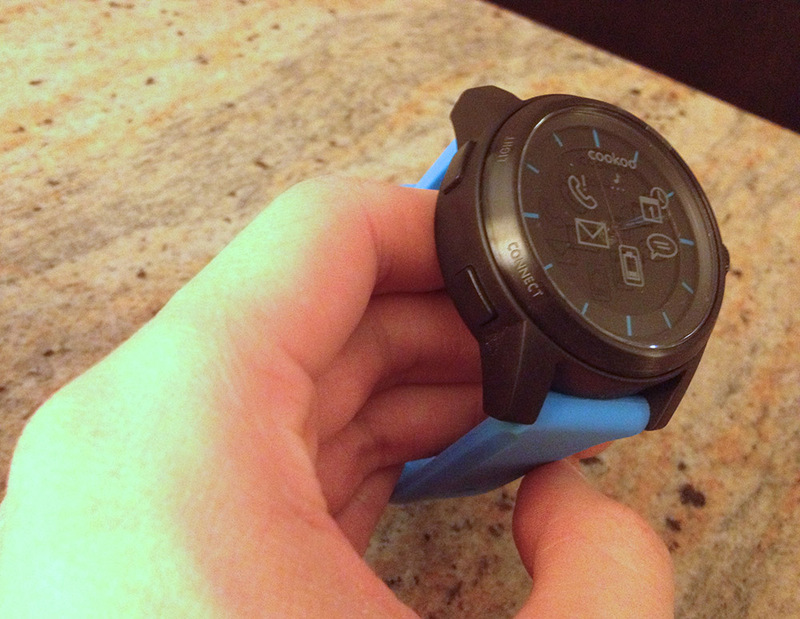 It’s plain, and when the Bluetooth component of the watch is off, there’s actually nothing on the face but the black background and blue watch hands. When you receive a notification, an icon on the watch face will blink. The icon itself does not light up– you still need to use the backlight to see it on the watch face in the dark, but this works great and the backlight makes it extremely easy to see the icons. This is why you’d buy the Cookoo over any other analog watch– it can connect to your phone over Bluetooth. It is worth noting that Cookoo only supports Bluetooth 4.0 because of its low power usage, so for now, only iOS devices are supported. There is a beta app for Android that seems to be coming soon, but support for devices is pretty minimal due to complications with Android’s Bluetooth stack. When I originally began using the watch, Bluetooth connectivity was relatively poor. The watch would drop the signal and not pick it back up at least once a day. The update to the iPhone app has seemed to mostly resolve the issue. I did have one occasion recently where the connection dropped, but after reopening the app the watch began to function correctly again and reconnected. When I walk out of range of my phone, the watch beeps once and disconnects, but has no problem reconnecting when I come back in range. Because Bluetooth 4.0 doesn’t have support for the MAP protocol, which is often used in car systems to send and receive text messages, and iOS doesn’t expose SMS data, there is currently no way to have the watch vibrate when you receive a text. For heavy texters, this may be a deal breaker. However, Facebook notifications and calendar reminders work great, and the watch beeps as soon as you receieve either one of these. The one issue with the Facebook notifications is the fact that they are lumped together and displayed using the message bubble icon on the watch. You’d expect that particular icon to show up for texts and Facebook messages, but pokes and Likes also will trigger the message bubble alert. Obviously, this isn’t really solvable due to the limited number of icons that can light up, but Cookoo is about letting you know something happened– not exactly what happened. I couldn’t get the low battery notifications to work– when my phone hits 20%, the phone will alert me, but the watch doesn’t seem to do anything. Bluetooth 4.0 uses very little power, so the watch is supposed to last up to a year of being connected to your phone. I can’t really test this, but it is nice to not have to worry about charging. The mechanical watch movement and time keeping uses a separate battery and runs for up to three years. The packaging of Cookoo, in my opinion, is brilliant. It not only fits in well with the entire theme of the watch, but it can be recycled and used as a bird house. Considering the packaging is one of the first things you see when a product is sitting at a booth at CES or on a store shelf, it’s extremely important to get right. Cookoo nailed it, in my opinion. Opening the packaging wasn’t difficult and the housing itself is extremely sturdy. Call me selfish, but I haven’t used it as a bird house because I actually want to keep the packaging for myself. Cookoo hasn’t changed my life, but it has changed my dependence on my phone– a little bit. I’ve finally grown out of the habit of using my phone to check the time (there was a point where I had the Cookoo on and still used my phone), and the tiny chirps are discreet and aren’t distracting to others. The one problem is, because Cookoo tells you something has happened, you may be slightly more tempted to check your phone to see what it is. But because I can now tell the difference between a calendar reminder and a message, I can see the calendar icon blink and say, “oh yeah, it’s 8’clock, so that must be my appointment alarm” instead of checking my phone to make sure it’s not an important message. Normally I have my phone on silent, so I don’t have the luxury of distinguishing between audio tones. In the end, Cookoo is a device to augment your phone– not replace it. The watch performs admirably at its task of telling the time, and for those that don’t like the “all digital” look of other smart watches and yet want to be always connected, the Cookoo may be for you. 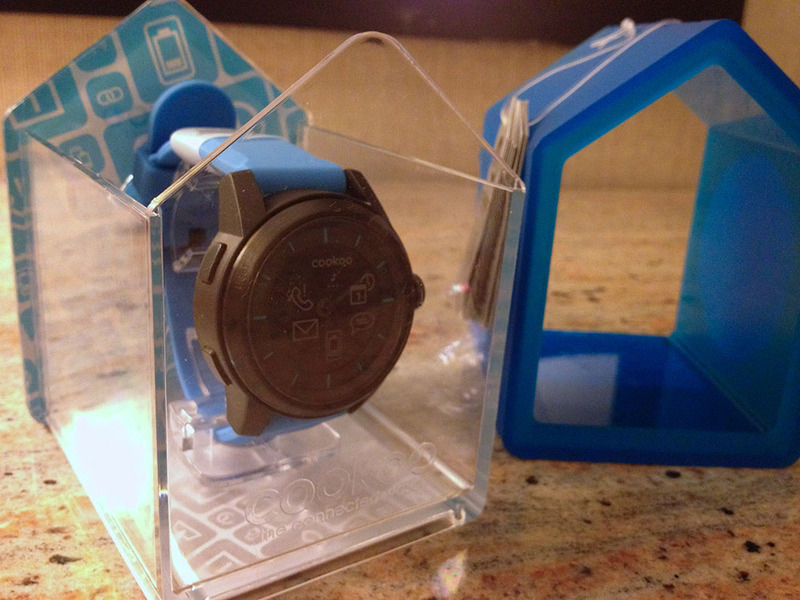 Just a note: all of the photos show the Cookoo watch with icons. To be clear, that is the sticker covering the watch face– not the icons lit up on the device. The icons themselves are on the black background, not directly on the glass face.